Q. Maybe you could just talk a little bit about the match. It looked like you were coasting in the first set, and then it got real tough as it went along and then you came back. 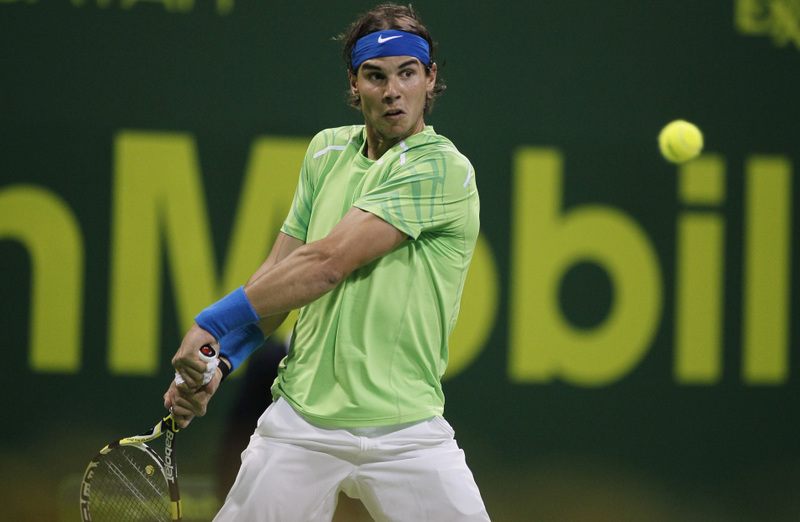 RAFAEL NADAL: In general, for me, was a really positive match. I think a played a very good first set. The only moment that I didn't play well was the beginning of the second and after the tiebreak. For the rest, I think I played a very solid match. I'm very happy about my level. I really played better than what I thought. So everything was really positive. Most important thing is I played really correct, really well, and I am through. So that's, you know, very important to keep having matches on the court with what's going on. Q. How is your shoulder doing? RAFAEL NADAL: My shoulder is fine. I said yesterday it's not 100% perfect. I feel something when I start at the beginning of practice, beginning of when I start to play, but later, after three, four minutes, when I get warmed up, I feel the shoulder with perfect conditions. So that's important thing. You know, the shoulder needs days like today to get the power, you know, but in general I'm happy. Q. Are you starting to get a bit of rhythm with the new racquet? Are you starting to get the feel of it? RAFAEL NADAL: I think I did a few things very well today. I hit very good with my backhand. I really believe that the racquet can help me with the backhand. With the forehand I felt I hit the ball most of the times where I want to hit the ball. Few days ago and yesterday in the practice, you know, when I tried to hit the ball, sometimes I hit it a little bit left, sometimes too early. That's why I didn't have totally the control of that, you know, the speed of the racquet, no? But today when we have rallies, I really felt that I have really positive control of the ball. Not perfect, for sure, but in general I think I felt most of the shots the right way. So that's really positive. Q. Have you changed racquets before in your career? RAFAEL NADAL: Yeah, I did at the beginning of 2005. 2005? Sorry. I did it at the beginning of 2004. 2004? 2005? Which year I played final in Auckland? '04? I think so. So 2004. Q. Are what was the change in the racquet then? Lighter or heavier? Q. How long did it take you to adjust to the change? A month? Several weeks? RAFAEL NADAL: I really don't know. Let's see, no? Maybe in a few more days I am adjusted. But when you decide to make any change, the beginning, you have to accept that the things won't be perfect, but you have to think when you have the change it's because we think it can help me more in the future. That's all. Q. Two years ago when you changed the string of your racquet, yellow one to the black one, would you say is the same process? RAFAEL NADAL: Well, especially that year when I changed from 2009 to 2010, I played final of Davis Cup, too. But straight after the Davis Cup I start to practice. I was able to practice for a month. And with the string, I really had better feeling with the string from the beginning. That's nothing ‑‑you don't change the weight. You change the string, so the string can work better, can work worse. You need time to adapt your game to the string, but seriously, that string work very well on my game from the beginning. The racquet, you feel something different when you are playing, but that's all the time, and the bad thing is 2009 I had the chance to practice for a month. This year I wanted to do the same, because on Wednesday I was in court for practice, but I had to stop on Friday for two weeks. The normal thing was didn't have the change because I didn't have time to adapt to the new racquet, but seriously I felt if I am not doing now, I will not do it for the rest of the season, so that's the moment. If I start the season with some troubles, we accept and we take the risk, but hopefully I believe that I can manage very well, no? Today was surprising match for me and positive one. Q. Back in the second set, was it Kohlschreiber coming out ‑‑obviously he went to the net a lot more, but what happened early on that made it difficult for you? Was it him being more aggressive, or was it something with your play that made it difficult? RAFAEL NADAL: I think he is one of the players that has, for sure, lower ranking than what his level says. That's a lot of people, most people think that. He's No. 43 of the world, but my feeling, his level is like top 25. So he can play at very high level. He has fantastic shots. His serve work very well for him moments today, and his return, sometimes I felt that I was serving okay, good, and sometimes his return was very fast. So was difficult. He's a complete player. You can say what he really is not doing well on his game, and you can analyze him. And he has a good backhand, a good forehand, positive volley, not bad serve, good serve, his movements are good. In general, he's a really complete player. Sometimes, you know, he has a few mistakes, but in general, he's one of these players that is not easy to play against. The only way to beat him is play well, because you don't want to feel like he's having mistakes for nothing. You have to play aggressive against him. You have to move him very well, because he has a fantastic backhand, and, you know, he's a tough player. But he did well. He played aggressive. He played with very good returns at the beginning of the second. I went a little bit behind the baseline. That's why. That's why. Q. After winning two or three doubles finals here with Marc Lopez, we were surprised not to see you playing doubles this year. Why? Is it because it makes you tired on the way to the Australian Open? RAFAEL NADAL: No, I was in the prelist of the tournament with him, but with the problem with my shoulder, I didn't have ‑‑I really didn't know if I would be here one week and a half ago, so I said, If I am here, I have to play singles. Later I have to play doubles. You know, the most important thing is the health, so cannot take this risk. That's, for me, sadly don't have the chance to play doubles, because in general, for me, the doubles help me to keep practicing well.